Take an hour out - breathe away the stress of trying to juggle work, family, and the holiday season. As wonderful as this time of the year can be, it can also be the cause for much stress. The timing is perfect; in the midst of Christmas activities, choir rehearsals, family and celebrating. With a long list of must do tasks, we almost always forget to take time to be still and breathe. Do something different this year. Take an hour out of your day to learn to BREATHE AND BE WELL. (Offered at DCM by Susan Duesbery from 6:30-7:30 p.m. this Thursday at Dominican Center. When we breathe shallowly, we send a signal to our brain that a crisis is about to happen; our bodies get flooded with stress chemicals. But when we breathe deeply, we send a signal that all is well. We are calm, peaceful and filled with a sense of well-being. Come learn several breathing techniques to help you manage stress and anxiety; energize yet calm your body and fill your system with vitality. Register online at: http://dominicancenter.com/programs/program/?id=298 or call DCM front desk at 616.514.3325. Cost $15.00. 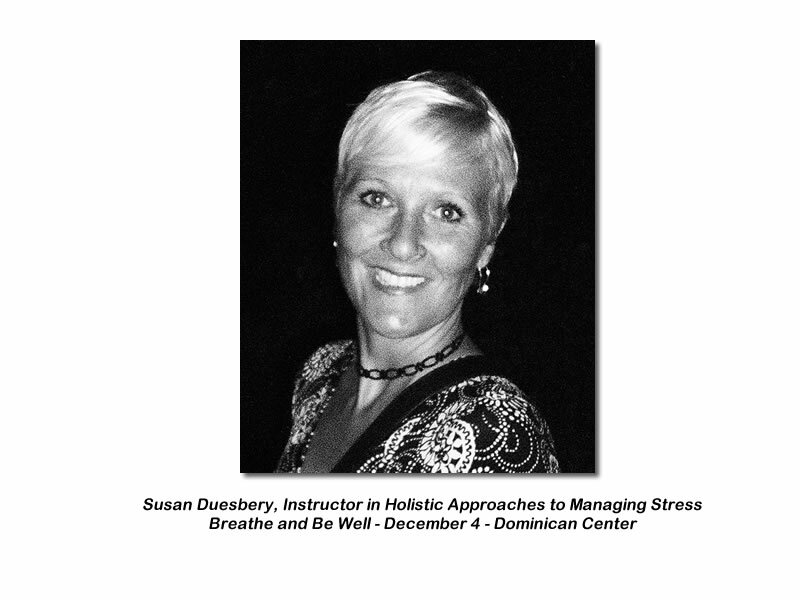 Susan Duesbery is a graduate of the Holistic Health Care Graduate Program at Western Michigan University, and holds a Certificate in Holistic Stress Management Facilitation from the Paramount Wellness Institute in Boulder, Colorado. She offers stress management and wellness presentations; workshops; and consultations to individuals, community groups, professional organizations, and businesses. She does this in order to offer information and tools to foster increased health, more joy, and a greater sense of peace in today’s stressful world. Susan is an adjunct instructor in Western Michigan University’s Holistic Health Care Department, where she teaches a course on Holistic Approaches to Managing Stress. Additionally, she teaches weekly yoga classes and many other forms of holistic approaches to coping with stress.